World Zionist Organization: there was an increase of over 383% in anti-Semitic incidents in July 2014 compared to this time last year. 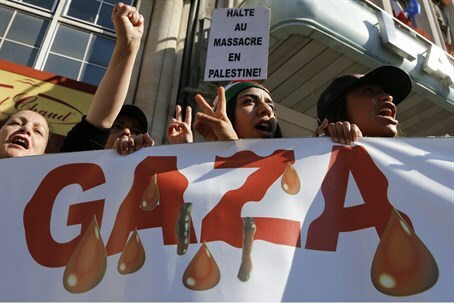 The communications center of the World Zionist Organization has found that there has been a dramatic increase in anti-Semitic incidents around the world. Sunday’s announcement comes following a study of the number of anti-Semitic incidents that occurred before Operation Protective Edge in Gaza and after it began. In July 2014, the study found, there were about 318 anti-Semitic incidents, compared to 66 over the same period in 2013, marking an increase of over 383% in cases of anti-Semitism. Among the regions of the world looked at in the study were Europe, South America, South Africa, Mexico, Central America, Oceania, the United States and Canada. According to reports, there was a significant increase of 436% in anti-Semitic incidents in Europe, a 1200% increase in anti-Semitism in South America, an increase of 600% in South Africa, an increase 800% in Oceania, an increase of 127% in the United States and an increase of 100% in Canada. Anti-Semitic attacks included physical assaults, such as last week’s incident when teenagers stormed a school bus in Sydney, Australia; throwing rocks at police officers during an anti-Israel protest in France; attacking Jews with a baseball bat in Paris; firebomb attacks on Jewish properties in Toulouse and Germany; vandalizing cars in Miami Beach, Florida; throwing smoke grenades Budapest, and other incidents. “It is 2014 and it seems as though we are living on the eve of World War II - before the Holocaust. The dimensions are enormous and incomprehensible,” he continued. United Nations Secretary General Ban Ki-moon said last week that the conflict in Gaza should not be an excuse for anti-Semitic slurs and attacks. "The Secretary-General emphasizes that the conflict in the Middle East must not constitute a pretext for prejudice that could affect social peace and harmony anywhere."